Shavuot is a Jewish holiday that celebrates the giving of the Torah on Mt. Sinai. The two day long holiday marks the end of the seven week Counting of the Omer– the time period between Passover and the day God delivering the Torah to Moses and the Israelites on Mt. Sinai. It took Moses and the Israelites seven weeks of trekking through the desert to reach Mount Sinai. Shavuot literally translates to “weeks” in Hebrew, emphasizing the conclusion of this seven week journey. 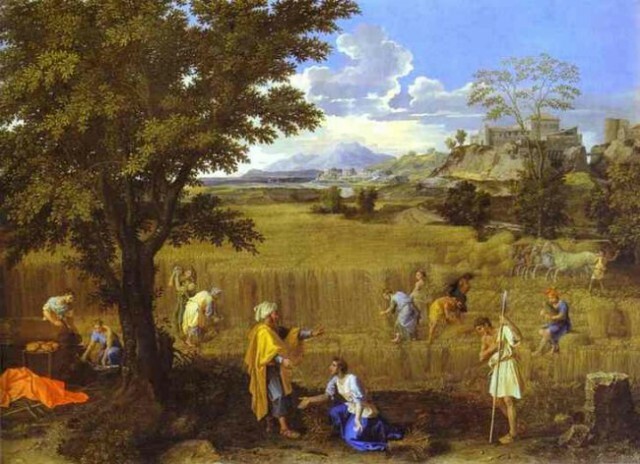 The timing of the holiday suggests that Shavuot may have been an ancient agricultural festival that took on special significance when the events at Mount Sinai occurred. Because of this, Jews will often “bring the outdoors indoors” by decorating the house and synagogue with flowers and greenery. Many Jews also celebrate the holiday by staying up all night on Erev Shavuot to study and symbolically prepare for receiving the wisdom of the Torah. This event is called Tikkun Leyl Shavuot (the Shavuot night watch). One of my favorite parts of Shavuot is the reading of the Book of Ruth. The story of Ruth has special significance to me and other Jews-by-choice– it is the story of the first conversion to Judaism. 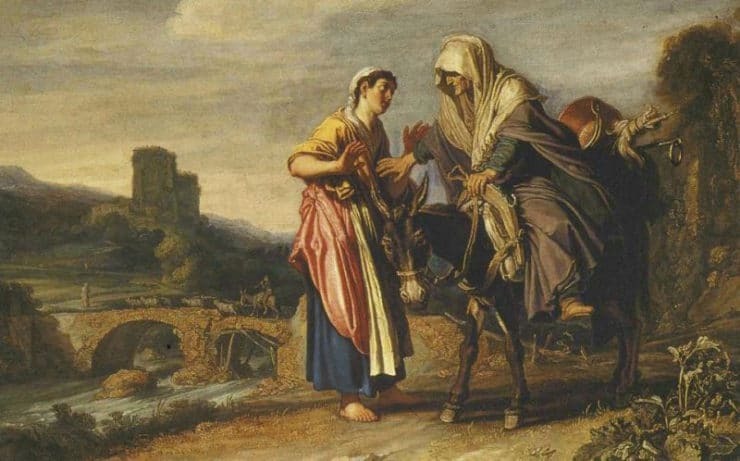 A famine forces Elimelech and his wife Naomi to flee from their Israelite home to the foreign country of Moab. Soon Elimelech dies, and Naomi is widowed in Moab. She continues living there with her two sons, who eventually marry two Moabite girls– Orpah and Ruth. Tragically, both sons also die, leaving Naomi to live with her two widowed daughters-in-law in a strange land. Naomi decides to leave Moab and journey to Bethlehem to live amongst the Israelites again. She encourages both Orpah and Ruth to return to their parents and remarry in Moab. Orpah reluctantly agrees, but Ruth refuses– out of love, she chooses instead to stay with her mother-in-law and embrace Judaism. This could not have been an easy choice, for Ruth had to leave behind everything she knew in order to stay with Naomi. Her kindness and obedience to God are eventually rewarded in Bethlehem, where she marries a wealthy farm owner named Boaz. Together they have a son named Obed, who becomes the grandfather of King David. My Christian readers will know that the Gospels trace the ancestry of Jesus to King David– so from the Christian perspective, Ruth’s choice to stay with Naomi and embrace Judaism also made her a part of this important lineage. Shavuot, like most Jewish holidays, has a food component. On Shavuot we celebrate dairy foods. It is a vegetarian holiday for kosher Jews, because the laws of kashrut forbid mixing milk products with meat. There could be a number of reasons for the association of dairy with Shavuot. 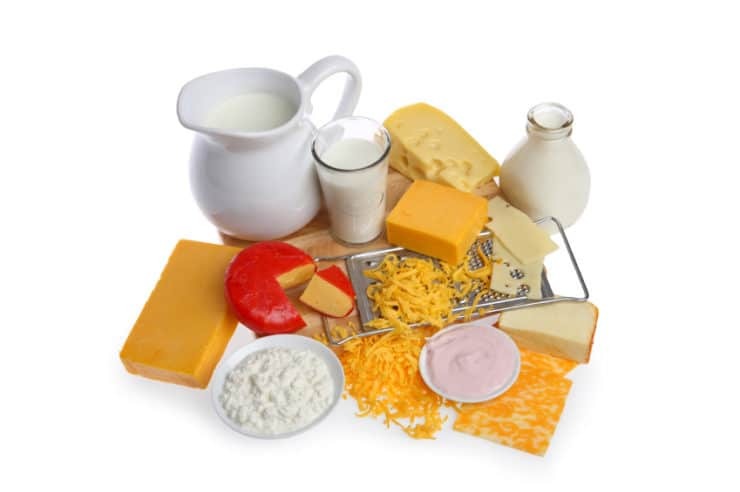 There is a verse in the Song of Solomon (4:11) which says that the Torah is like “milk and honey under your tongue,” which might indicate a connection between the Torah-centric holiday and dairy foods. Some also believe that because the Israelites had not yet received the kosher laws, they had prepared foods on the first Shavuot that did not follow kashrut. When they received the Torah, they read the new laws of kashrut and realized their meat dishes were not kosher, in accordance with God’s will– so they opted to eat dairy dishes only. I read in the most recent issue of Tribe Magazine that the Hebrew word chalav (milk) has a numerical value of 40, which corresponds with the number of days Moses spent on Mount Sinai receiving the Torah. Still others say that Shavuot occurs during the fertile spring period, when animal mothers produce lots of fresh milk. This recipe creates a classic New York-style cheesecake, a great base to which you can add your own special embellishments. Feel free to top it (I’ve provided my blueberry topping recipe here), or mix in other ingredients to create new and exciting cheesecake flavors. 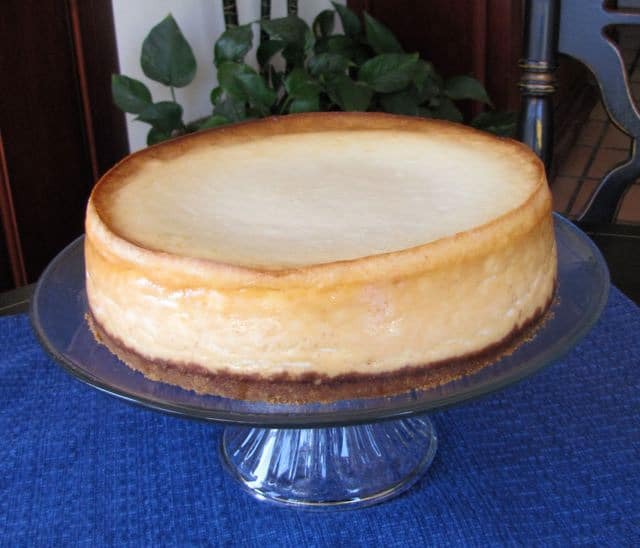 Or, if you’re a cheesecake purist, serve it as-is… it should impress any true cheesecake aficionado. It has never let me down! Learn the history of the Shavuot holiday, then celebrate the holiday with a rich and delicious New York-style cheesecake recipe. Kosher, Dairy. You will also need: Springform pan, parchment paper, food processor, roasting pan for water bath, a teapot. Nutrition information is for plain cheesecake only. About 45 minutes before baking, take the cream cheese out of the refrigerator so it can return to room temperature. 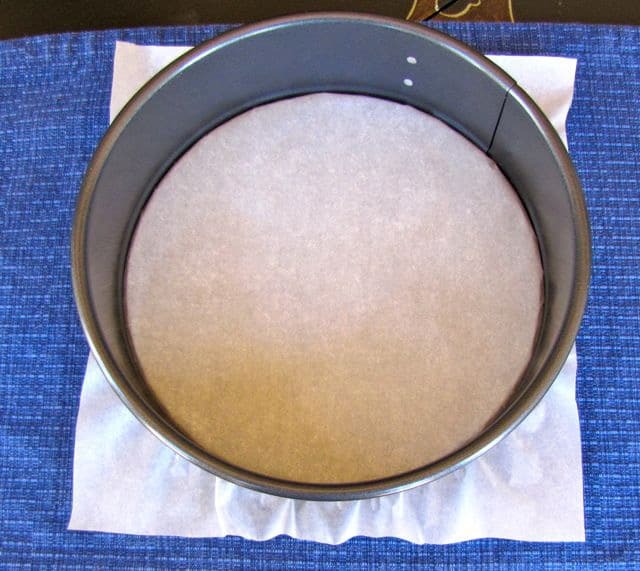 Preheat oven to 325 degrees F. Place a piece of parchment paper over the bottom of a 9 inch springform pan, then seal the springform pan edge around the base. The base should be covered by parchment paper with edges of the paper sticking out from the sides of the pan. This paper will keep the cheesecake from sticking to the bottom of your pan. Grease the inner sides of the springform pan with butter or cooking spray, making sure the sides are fully coated. Do not spray the parchment paper on the bottom. IMPORTANT: Make sure your springform pan is fully locked and secure around the parchment paper! There is nothing worse than filling a springform pan with batter and having the pan fall apart or leak on you. If you have an older or lower quality pan that doesn't lock tightly, you may want to cut the parchment paper into a circle to line the bottom rather than letting the edges stick out, so there is no layer of parchment to interfere with the seal. In a food processor, pulse together graham crackers, powdered sugar, chopped walnuts, cinnamon, nutmeg and salt until a crumbly powder forms (about 30 seconds of processing). Pour the melted butter over the crumbs and continue to process for another 10 seconds. Push the crumbs down the sides of the processor, stir them with a spoon, and continue processing for about 10 more seconds. At the end of processing, crumbs should be evenly darkened/moistened by the butter. Press crumb mixture firmly in an even layer across the bottom of the springform pan. Thoroughly clean and dry the food processor. Pulse together all of the cheesecake filling ingredients in the food processor, using short 1-second pulses to blend the ingredients for about 15 seconds total mixing time. Do not overmix-- this will cause the cheesecake's texture to change. Filling consistency should be smooth (no lumps), but not watery. Fill the teapot with water and heat it up on the stovetop. 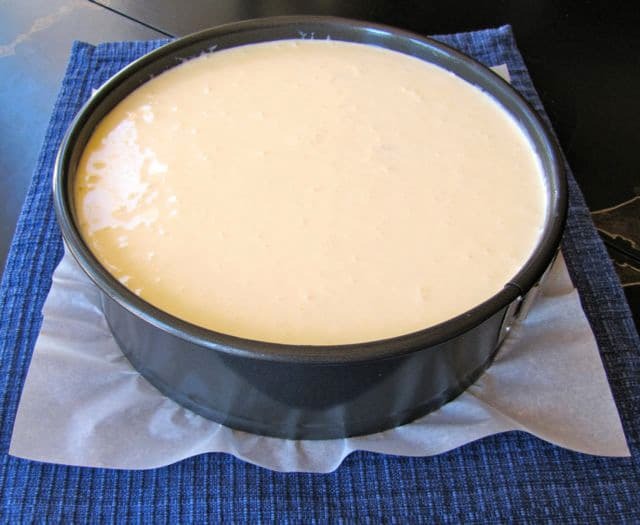 While water is heating, pour the cheesecake filling carefully into the prepared springform pan. 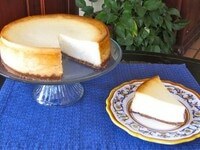 Smooth the surface of the cheesecake filling with a spatula or spoon; pop any large bubbles that rise to the surface. When the teapot boils, carefully fill a wide roasting pan with the hot water (don't burn yourself!). Place the roasting pan on the bottom of the oven, and place the springform pan onto the middle rack of the oven above the pan of water. 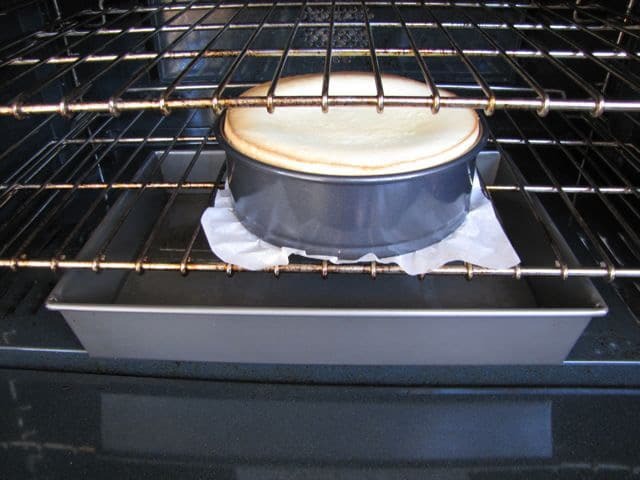 This creates a steamy environment in the oven, which allows the cake to bake more evenly (see note below). Close the oven and bake at 325 degrees F for one hour. After 3 hours, remove the pan from the oven. Let it return to room temperature, then place the cheesecake in the refrigerator and chill for at least 12 hours. Gently remove the cake from the springform pan after it is thoroughly chilled. If using a topping, spread it on after chilling the cake. Serve cold. In a small saucepan, heat 1/3 cup of water. Slowly dissolve sugar and cornstarch as the water heats up. When mixture boils, add blueberries. Stir slowly and constantly for 4-5 minutes until mixture is thick, syrupy, and bubbly. Remove from heat and stir in the lemon juice. Let the topping return to room temperature, then place it in the refrigerator to chill for 1 hour. Stir well before spreading on top of the cheesecake. Hi Tori, I love your recipes! I always make them following your instructions exactly, but this time I’m planning on making it for my mother in law’s birthday. She is diabetic and cannot eat sugar. Hi Patricia, Tori’s assistant Ashley here. Unfortunately neither Tori or I have experience using xylitol, so I’m not sure how to be helpful here. I would try googling how to substitute sugar with xylitol and see if anything helpful comes up. 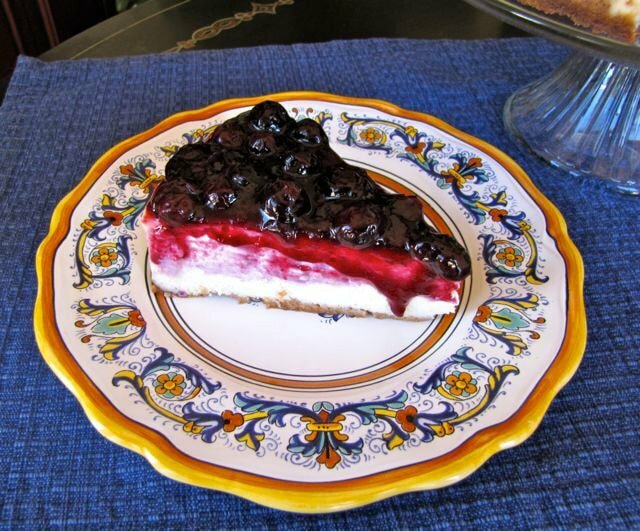 The best cheesecake I have ever made and the blueberry sauce is delicious too! So glad you liked both! And so appropriate, given your name is Ruth. 🙂 Love it! Thank you, Tori, for another fantastic recipe! I made this over the weekend for my sister’s birthday. I added chocolate chips and used Oreo’s and toasted pecans for the crust. It turned out sooo good!! Next time, I definitely want to use your recipe for crust. Mine did crack on the top in 3 places, but I’m blaming the chocolate chips on the top (the crack was almost connect-the-dots) and the big window open in the kitchen making my oven cool down too quickly 😉 Everyone still thought it looked and tasted great. 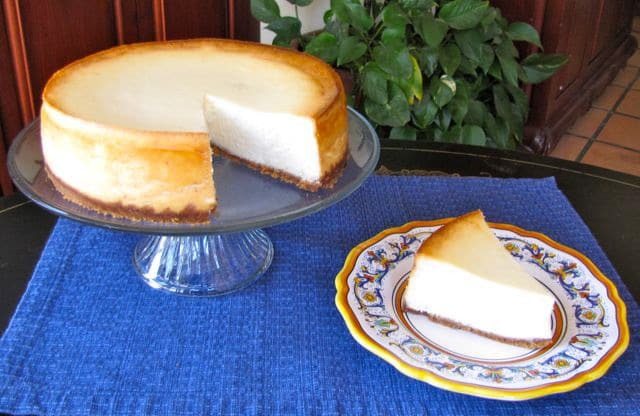 Here’s a recipe for dairy free cheesecake! In bowl of stand mixer, beat the Better Than Cream Cheese and almond milk until well-combined. Add 1/4 cup of sugar, 3 egg yolks, cornstarch and lemon juice. Continue mixing until smooth. Using hand mixer in a small mixing bowl, beat egg whites until soft peaks form. Set aside. Return to the stand mixer and gradually add in the remaining 1/4 cup sugar and cream of tartar. Mix on medium to medium-high for 6 to 8 minutes. Using a spatula, fold in the egg whites very gently. Pour batter into cake pan. 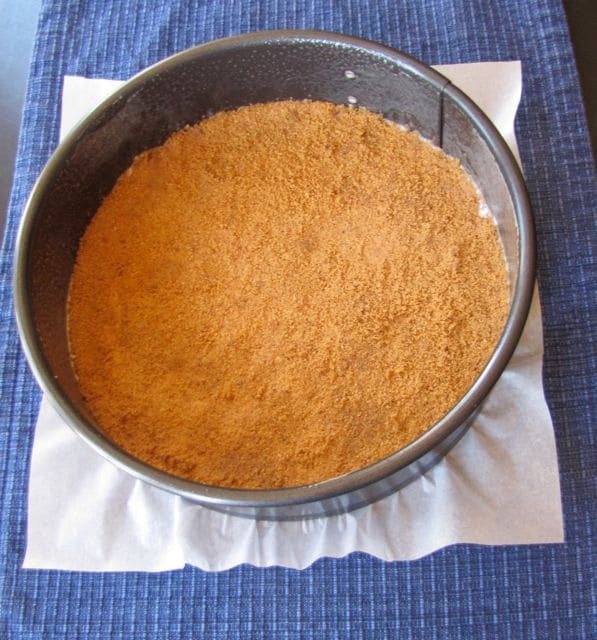 Place cake pan in a large roasting pan and put into the oven. Pour boiling water into the roasting pan, enough to come about 2/3 of the way up the cake pan. This creates a water bath. Bake for 30-35 minutes. A cake tester or toothpick inserted in the middle of the cake will come out clean when it is finished. Light browning may start on the top near the end of baking time. Sorry for the belated answer, it’s been a very busy week! Diane, you can definitely sub lowfat cream cheese and sour cream. You can also use 2% milk instead of half and half– the texture may change slightly, but it will be a lighter cake that way. Karina, try using the strawberry topping from the blintz recipe I posted today, it will work too! Richard, I wish I could help… hard to imagine a cheesecake without cheese. If I here of anything I’ll post a follow up comment! This looks heavenly! Could I substitute lowfat products to make it a little less “naughty”? Desperately need recipe for non-dairy cheesecake. We don’t keep kosher, but wife is dairy allergic. Would really appreciate help. There are heaps of non dairy mock cheesecakes. Lime adds a cheesy flavor to raw vegan in cheesecakes. I’ve made a white chocolate mock cheesecake with cacao butter and puréed cashews and line zest. Many people use soy cream cheese, blitzed with sugar and set with agar agar which is a kind of seaweed based gelatin common in Asian food. What a wonderful explanation of Shavuot and the custom of eating dairy! Kudos to you. Wish my wife would make this for me. I’m going to send her the link and say pretty please, maybe that will do it. Better yet, maybe I should try making it for her. It might turn out better. Tori, you keep topping yourself- this looks unreal! And love the step-by=step process too. Wish my diet was DONE so I could indulge. Can’t wait for the cookbook! I might make this for our synagogue’s Shavuot celebration, looks so good! This look very good I will try. Do you have idea for other topping? My son hate bluebverry. What a nice surprise! I tried to make a cheesecake last month and failed miserably. Great to have these steps and pictures to follow. I didn’t put the parchment paper at the bottom of the pan and it stuck really bad. Cool learning about the Jewish holiday too. Thank you for this!